We are thrilled to present the new T-shirt of the BCN Student Chapter. 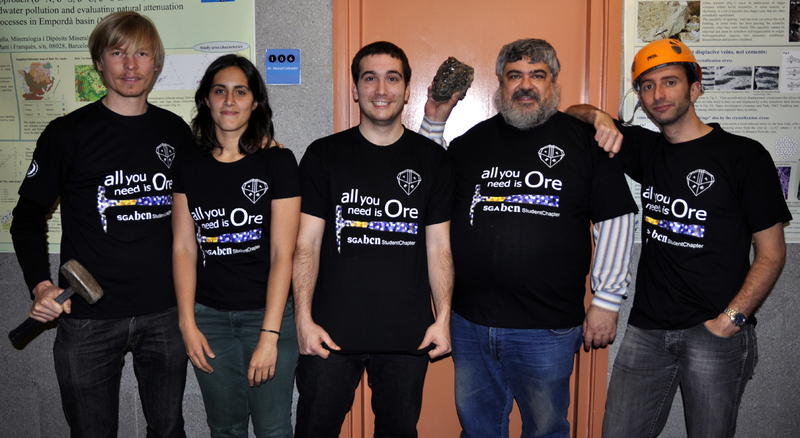 The main theme of this design is the Gaudí-style hammer which is the official logo of our association, combined with the sentence “All you need is Ore” making reference to the popular song by The Beatles, capturing our devotion to ore minerals. They also have the SGA logo printed on one sleeve. The T-shirts are black in colour and are available in different sizes (S, M, L, XL & XXL), in both regular and girly versions. And remember... All you need is Ore!!! Visiting the Adelaide Mine, the Crocoite’s dream world! Marc Campeny Crego a PhD student from the BCN-SGA Student Chapter is carrying out a scientific stage in the University of Tasmania (Australia), relatively close to one of the most wonderful mineralogical places in the world: the crocoite’s mines from Mt.Dundas in Zeehan, NW Tasmania. 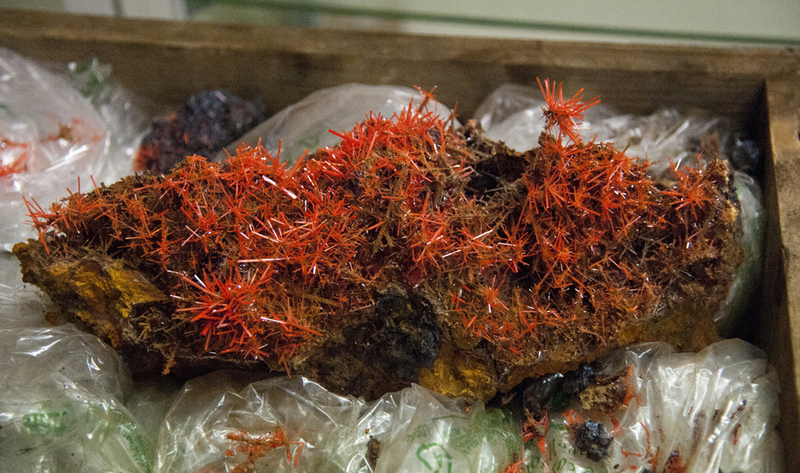 Crocoite is a very rare lead chromate (PbCrO4) famous for its amazing red colour and its delicate acicular crystallizations. Its type locality is the Tsvetnoi Mine in the Urals region, Russia but the Tasmanian crocoites are considered without doubt the most exceptional specimens all around the world. Marc visited the Adelaide Mine, an ancient lead and chromium mine now only exploited to extract crocoite specimens for mineralogical collections. Sulfide deposits located in the Northern Apennine of Italy have been known as a workable source of copper since 3500 BC, thus providing evidence for the earliest copper exploitation in Western Europe. The most important copper deposits are associated with the Western Alps and Northern Apennine ophiolites, which represent fragments of the sub-oceanic lithosphere that floored the Liguria-Piedmont Tethys. This embryonic ocean formed by divergence of the European and the Adriatic Plates in Jurassic times, and closed between Late Cretaceous and Early Eocene. The sulfide deposits of the Northern Apennine are characterized by the metal assemblage Fe-Cu-Zn typical of ophiolite-hosted Volcanic Massive Sulfide (VMS) deposits. They consist of the hydrothermal ore assemblage pyrite-chalcopyrite-sphalerite with or without pyrrhotite, galena, magnetite and other accessory ore minerals (linneite, millerite, marcasite, covellite, gold, silver, acanthite, freibergite, ilmenite, rutile, uraninite, hydroromarchite). Quartz, calcite and chlorite are major gangue minerals, along with accessory siderite, epidote, titanite, apatite and zircon. The Northern Apennine deposits represent a rare example of seafloor-stratiform, stratabound, and sub-seafloor stockwork ore-bodies associated with both the ultramafic basement and the basalt volcanic cover in one single ophiolite sequence. Sulfur isotope values in VMS deposits of the Northern Apennine ophiolites have an overall average of 5.9 δ34S‰, similar to other VMS deposits of the eastern Mediterranean Tethys, i.e. Troodos (4.6‰) and Eastern Turkey (4.2‰). They differ, however, for a much wider range of δ34S, varying from +11.4‰ to -2.9‰.The sulfur isotope variations observed in the Northern Apennine VMS deposits reflect the influence of the different environments of sulfide deposition (seafloor vs. subseafloor) and different lithologies of the host rocks (basalt vs. serpentinite). Platinum group minerals (PGM), with few exceptions, occur as small phases less than 10 microns in size. Therefore, to analyze them is a difficult task. Due to their small size, they cannot be investigated by X-ray and, as a consequence, the most used technique to recognize PGM is the electron microprobe. However, this methodology applied to PGM is relatively complicate and consuming-time. In a paper published about 20 years ago , it was suggested Raman spectroscopy a possible tool to investigate PGM. Since Raman is a non-destructive and structurally sensitive technique, can be easily used to identify small mineral phases less than 10 microns in size, such as PGM. However only 6 Raman spectra were published for the following natural PGM: cooperite (Pt,Pd,Ni)S, sperrylite (PtAs2), platarsite (PtAsS), moncheite (Pt,Pd)(Te,Bi)2, braggite (Pt,Pd,Ni)S and potarite (PdHg). Therefore, in this contribution preliminary Raman results obtained, for the first time, on a great variety of PGM, are presented. PGM sulphides, arsenides, sulpharsenides display a very well-defined and characteristic spectrum, as typical for the compounds characterized by the presence of covalent bonding. On the contrary, the Raman spectra of a number of alloys and native elements show no discernible scattering bands suggesting that the possible bonds present in these PGM are metallic or ionic. Few PGM, classified as possible Ru bearing oxides, show a broad and weakly scattered spectrum over the range of about 100–800 cm-1. The collected data also demonstrated that Raman is sensitive on the compositional variation, particularly in the PGM characterized by a solid solution substitution such as laurite (ideally RuS2)-erlichmanite (ideally OsS2) series. These results confirm that Raman spectroscopy can be considered an innovative and complementary technique with a huge potential to better characterized and identify rare and tiny phases such as PGM. 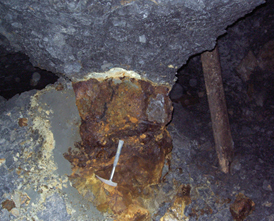 The two main disadvantages of the Raman spectroscopy applied to the investigation of PGM are: 1) some PGM, such native elements and alloys, are not sensitive to this technique and 2) it does not provide a chemical composition of the investigated minerals. Therefore, it is intended to apply the Raman spectroscopy to a great number of different PGM, already chemically characterized by electron microprobe, with the target to create a future and accessible data base of Raman spectra of a great number of different PGM. Mernagh T.P. and Hoatson D.M. (1995) Can. Mineral., 33, 409-417. Isaac Corral is the first Barcelona SGA Student Chapter member to finish his Doctoral Thesis, entitled “Geology and Metallogeny of the Cerro Quema Au-Cu Deposit (Azuero Peninsula, Panama)”. It was presented last Friday (10th of May) in the Universitat Autònoma de Barcelona. 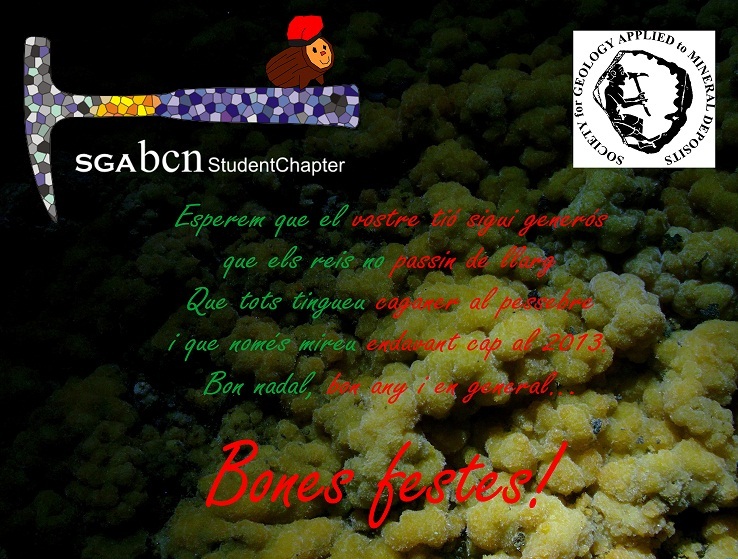 The Barcelona SGA Student Chapter wishes all the best for the future of such a good scientist! Our colleague and member of the Barcelona SGA Student Chapter, Isaac Corral, will defend his thesis, entitled “Geology and Metallogeny of the Cerro Quema Au-Cu Deposit (Azuero Peninsula, Panama)” on Friday 10th of May. 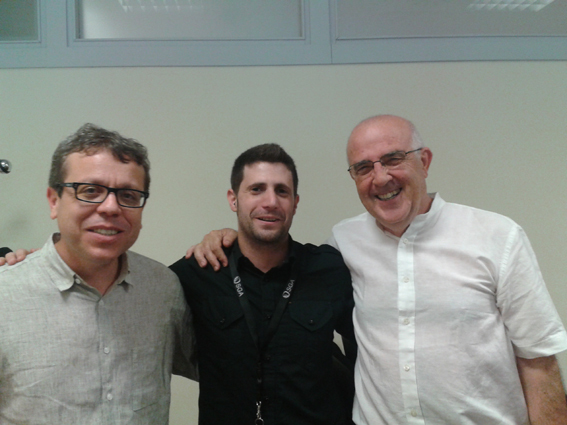 The defense will be held at the Science Faculty (Sala de Graus) of the UAB (Universitat Autònoma de Catalunya) at 11 a.m. Isaac is the first Barcelona SGA Student Chapter member to finish his Doctoral Thesis, so we all wish Isaac all the best with the defense. Cerro Quema, located in the Azuero Peninsula (SW Panama) is a structurally and lithologically controlled high sulfidation epithermal Au-Cu deposit. It is hosted by a dacite dome complex intruded within the Río Quema Formation, a volcanosedimentary sequence of Late Campanian to Maastrichtian age deposited in a fore-arc basin. 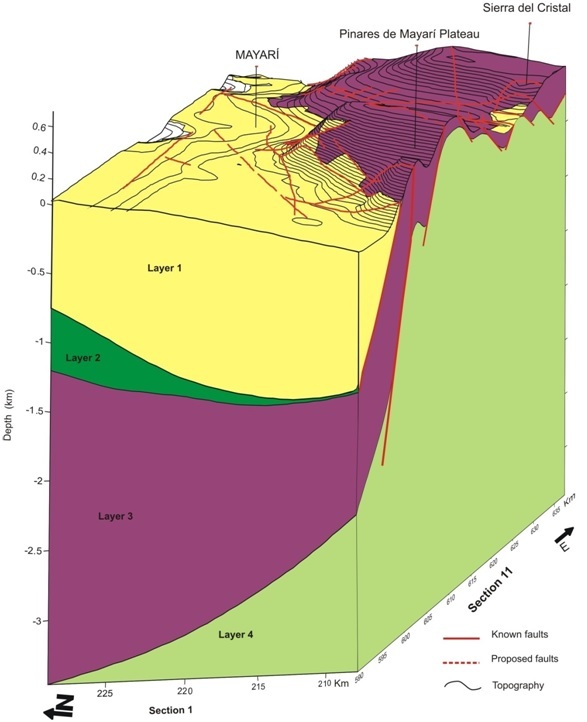 Au-Cu mineralization and hydrothermal alteration is controlled by E-W trending regional faults. In order to unravel the relationship between the geological evolution of the area and the Cerro Quema mineralization, a detailed study of the tectonostratigraphy, geochemistry and biostratigraphy of the Azuero Peninsula is presented. Additionally, new data on the ore and alteration (hydrothermal and supergene) mineral parageneses and Ar/Ar geochronology (hornblende) is presented to find out the age of the Au-Cu mineralization. The origin and evolution of mineralizing fluids is discussed from fluid inclusion (homogenization temperature and salinity) and stable isotopes (S, O and H) data performed on sulfides, sulfates and silicates. According to field observations coupled with geochronological and biostratigraphical data, Cerro Quema is a high sulfidation epithermal deposit emplaced during Lower Eocene (~55-49 Ma) times, and is probably related to an underlying porphyry copper system. Mineralizing fluids were of variable temperature (140 - 240ºC) and low salinity (< 5 wt% NaCl eq.). Hydrothermal fluids were sulfide dominant with sulfur of magmatic origin (δ34SΣS= -0.5‰). d18O of fluids in equilibrium with vuggy silica (-2.6 to +3.0‰) and d18O/dD values of kaolinite/dickite (d18O= -10.0 to +13.3‰; dD= -72 to -13‰, respectively), indicate that mineralization was produced by the mixing of hydrothermal fluids with meteoric waters. Cerro Quema is only a part of an extensive hydrothermal system that produced similar deposits in the southern portion of the Azuero Peninsula. Alteration minerals domains registered under Loma La Cuaba: new insights on the origin of Pueblo Viejo deposit. Depósitos “no convencionales” de elementos del grupo del platino (EGP). Comparison of trace-element geochemistry of Loma Caribe peridotites (Dominican Republic) with others peridotite bodies along the northern margin of the Caribbean Plate. The evolution of the Caribbean lithospheric mantle seen in platinum-group minerals and zircons from chromitites of the Mayarí-Baracoa Ophiolitic Belt (Cuba). “Garnierite” mineralizations from the Falcondo Ni-laterite deposit (Dominican Republic): new insights from XR quantitative element imaging. Joaquín and Lisard also took part in an amazing post conference field trip to ophiolites in the Havana-Matanzas region. 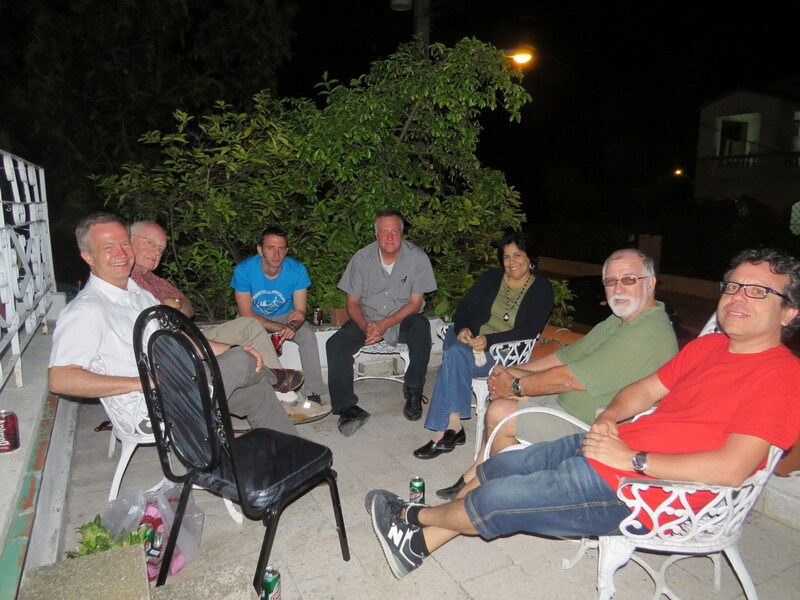 In Havana they met old and good friends of our student chapter such as Carl E. Nelson and José Batista among many other colleagues that we hope that will collaborate with our association in the future. Doing research in the Antipodes ! Montgarri Castillo i Oliver, a PhD student of the Barcelona SGA Student Chapter, has gone to Sydney for a short research stay. She will join the GEMOC Research group, in Macquarie University (Sydney) and her work will be supervised by Dr. Bill Griffin, Dr. Sue O’Reilly and Dr. Norman Pearson. During the following 3 months, she will carry out U-Pb dating, Sr and Nd isotopes, as well as trace element analyses on perovskite, zircon and titanite grains from several Angolan kimberlites. Additionally, she will analyse trace elements on sulphides from Bolivia and Pb isotopes on pyrochlores from Angola. 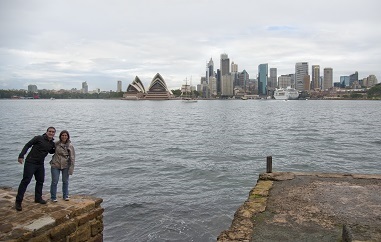 Marc Campeny is also doing part of his PhD research in the Antipodes, in Hobart. For two months he will work with Dr. Vadim Kamenetsky in the School of Earth Sciences of the University of Tasmania. 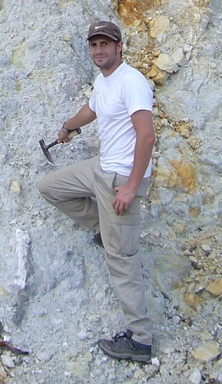 He will mainly focus on the study of melt inclusions on apatite and calcite from Angolan carbonatite rocks. We wish all the best to our colleagues! Title:The Ni-Cu-PGE Keivitsa deposit, Northern Finland: an example of hydrothermal remobilization of the platinum group elements(El yacimiento de Ni-Cu-PGE de Keivitsa (Norte de Finlandia): un ejemplo de removilización hidrotermal de elementos del grupo del platino). Lecturer:Dr Fernando Gervilla Linares. Dept. Mineralogía y Petrología, Instituto Andaluz de Ciencias de la Tierra, Universidad de Granada. Date:Tuesday 26th February 2013, 17.00h. El yacimiento de Ni-Cu-EGP de Keivitsa encaja en un cuerpo máfico-ultramáfico intruido hace 2.05 Ga en la zona Central de Laponia, en el norte de Finlandia. El yacimiento está constituido por una diseminación de bajo grado de sulfuros de Ni-Cu en clinopiroxenitas olivínicas parcialmente alteradas. El yacimiento contiene también zonas ricas en metales nobles (EGP y Au) en las que el contenido medio total de metales nobles es de 2.19 ppm. Las zonas ricas en EGP+Au presentan una morfología de chimenea y se asocian a zonas con contenidos de Ni y Cl superiores a los valores promedio. La mineralogía de los EGP está constituida por minerales de Pt (braggita, sperrilita y moncheita) con menores cantidades de minerales de Pd (bismutotelururos de Pd), los cuales se encuentran, princialmente, incluidos en silicatos hidratados y, en menor medida, adheridos a los bordes de grano de los sulfuros. Las "chimeneas" ricas en PGE+Au constituyen el núcleo de una estructura zonada, difusa y asimétrica en la cual la distribución de azufre ocupa la zona más extensa, dentro de la cual se concentra el cobre y, en el núcleo central, el Ni y los EGP. Esta distribución espacial es el resultado de la remobilización hidrotermal de una mineralización de Ni-Cu magmática primaria. 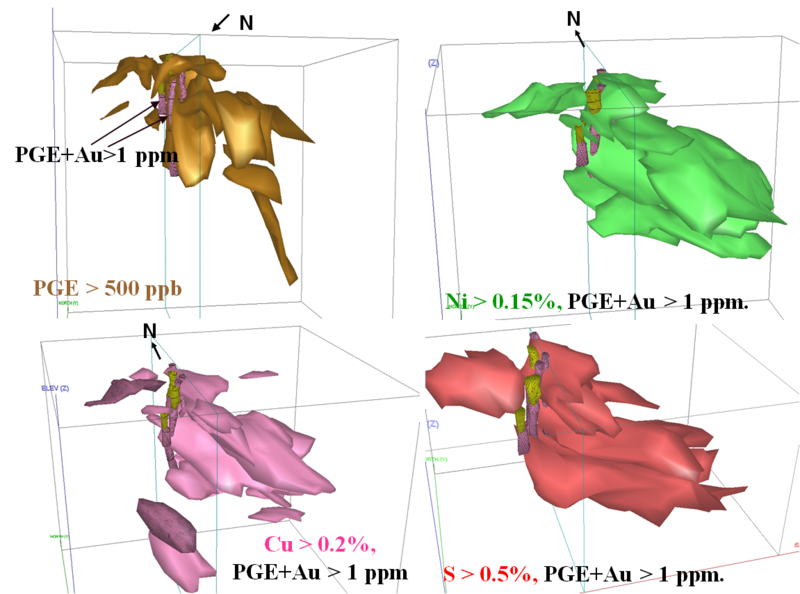 To learn more about this deposit: Gervilla, F., Kojonen, K. (2002): The Platinum-Group Minerals in the Upper Section of the Keivitsansarvi Ni-Cu-PGE Deposit, Northern Finland. The Canadian Mineralogist, 40, 377-394. Abstract: La prospección de depósitos minerales tiene como finalidad identificar y cuantificar los recursos y reservas minerales, vinculados a un ambiente geológico determinado. En este sentido los métodos geofísicos juegan un papel muy importante permitiendo estudiar las variaciones litológicas y estructuras de la región investigada, así como localizar y caracterizar cuerpos minerales. Dentro del grupo de métodos geofísicos más importantes para desarrollar esta tarea se encuentran los métodos eléctricos, magnético, gamma espectrométricos, gravimétrico y sísmicos. En esta presentación se mostrará el alcance de los métodos magnético y gamma espectrométricos, en sus variantes aéreas, durante la prospección de depósitos de cromo y lateríticos de Ni-Co en ofiolitas. Tomando como ejemplo la región nororiental de Cuba, se muestran dos casos de estudio. En el primero, se realiza la inversión 3D de datos aeromagnéticos para caracterizar las unidades ofiolíticas y rocas asociadas. A partir del modelo 3D se pueden establecer criterios regionales para la exploración de depósitos ofiolíticos de cromo de grado refractario y metalúrgico. En el segundo caso de estudio, se muestran la aplicación de la espectrometría de rayos gamma para caracterizar los depósitos lateríticos de Ni-Co desarrollados sobre los macizos peridotíticos. La espectrometría de rayos gamma permitió establecer los límites de las cortezas de meteorización, valorar las variaciones cualitativas de sus espesores, así como definir bloques no laterizados ("intercalaciones estériles") dentro de dichas cortezas. To learn more about this topic: Batista J., Pérez-Flores M.A., Quiroga-Goode G., Gallardo L.A., 2007, Geometry of ophiolites in Eastern Cuba from 3D inversion of aeromagnetic data, constrained by surface geology. Geophysics, 72, (3), May-June, B81-B91. Barcelona SC wishes you a Merry Christmas!! and that everybody look forward the 2013. * you can learn more about the strange catalan Christmas traditions here and here. Thanks, Nia, for this fantastic postcard!! The Barcelona SGA Student Chapter on television. The Catalan Public Television (TV3) has recently broadcasted the report about the pegmatites from the Cap de Creus. The report was included in the programme “El Medi Ambient” into the midday prime time. We would like to thank to the TV3 reporters for their effort and patience. What is clear is that the outcome is really excellent and informative. Enjoy it! Two new PhD students in our Student Chapter!